The Carlisle Brass Classic Cylinder Pull Satin Chrome is very practical and fits around a Yale type cylinder used on a nightlatch, typically on a front door. It is used to pull the door closed from the outside. 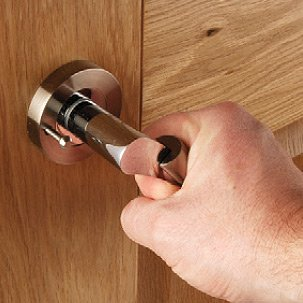 A cylinder pull is particularly useful if there is no door handle or centre door knob on the external door which would be used to pull it closed. The pull is made from solid brass and has a satin chrome finish.